Ahh!! We all love one-dish quick and easy meals. Right? Especially if they’re healthy ones. This Mexi-Quinoa bake is healthy, quick, delicious, and has just the right amount of spice. This recipe uses ground chicken instead of the traditional use of ground beef. Quinoa instead of rice. Nutritional yeast to lower the use of cheese. AND non-fat greek yogurt instead of sour cream. SEE! It is so easy to make delicious dishes with healthy ingredients. 1. In a small pot, bring quinoa in vegetable broth to a boil, lower the heat, then allow to simmer until cooked (~25 minutes). **Follow the regular quinoa cooking directions on package ..just replace the water with vegetable broth for extra flavour**. You can also use chicken broth too. 2. In a large skillet on medium-high heat, add olive oil and the ground chicken. Break up the chicken with regular mixing. Add in the chili powder and garlic. 3. While the chicken is cooking, prep your vegetables. Chop and dice and put in a bowl. You will add the veggies and more garlic to the chicken skillet when the chicken is fully cooked. 4. When the ground chicken is cooked thoroughly (no pink throughout ~20 minutes cook time), add your diced/chopped vegetables. 5. Saute veggies with the chicken on medium heat for about 7-10 minutes. Turn oven on to preheat at 350F. 6. When quinoa is fully cooked, pour it into the bottom of a casserole dish. 7. Add the chicken/vegetable mixture on top of the quinoa layer. 8. Add the last top layer – sprinkle the chili powder, nutritional yeast, cumin, and cheese evenly across the top. 9. Bake on 350F for ~17 minutes and broil for the last 2 minutes. BBQ season is on its way!! (even though it might not look like it right now with that new batch of snow on the ground). I love bbq’ing even when it is cold out. Last night I created a new healthy turkey burger recipe so you can eliminate those box-bought burgers that are backed with ingredients… you can’t even pronounce. Nutrition Facts per 1 burger patty: 189 calories, 2.5 g fat, 27.6 g carbs, and 13.4 g protein. For few calories you get high amounts of lean protein that will leave you satisfied after dinner. 1. Start with sauteing your mushrooms on medium-high heat in a skillet with 1 tbsp olive oil for ~7-10 minutes. When finished, set aside. 2. Mix all other ingredients thoroughly in a large bowl – you may need to use your hands! 3. Add mushrooms to the mix. Thoroughly distribute and mix. 4. Spread a sheet of tin-foil on the counter. Drizzle to cover it with olive oil (this is to prevent sticking). 5. Make 4 burger patties and set them on the tin foil. 7. Cook the burger patties on the tinfoil on the bbq for about 15 minutes (flip to brown each side. Then move onto the grill when the outside layer of the burger is cooked enough that it wont fall through! I usually eat my burger plain on a bed of lettuce and we served ours with a side kale salad. My dad however, topped his burger with gouda cheese, onion, and an egg bun and LOVED it. Either way is absolutely delicious and these burgers are very filling. Plain 0% Greek yogurt to taste (a healthy alternative to sour cream). 2. In a small skillet, saute the peppers and onion skin 1 tbsp olive oil (~7-10 minutes). Heat the frozen corn niblets in the microwave following package instructions. Add the chopped lettuce on the bottom of the bowl, top with avocado, tomato,sautéed vegetables, corn, and chicken. 4. Add Mary’s crackers crumbled on top (a healthier alternative to tortilla/nacho chips) and add shredded cheese as desired. 5. Sauce it up with salsa as your topping and plain 0% greek yogurt! I used my moms home-made salsa to top. I will be posting our family recipe for that very soon if you are a dare-devil and into the hard work of canning. It is delicious! I am back in Canada and back with my OVEN! WOOO! So of course I rushed into the kitchen to create some new recipes. Today’s creation was a Mexican casserole/lasagna type dish. I used Food For Life‘s gluten-free brown rice tortillas to make the layers. It is an easy filling dish to make for a potluck, a one dish dinner, etc…. with only 135 calories per serving!!! There are 2 layers. Layer 1 consists of peppers, tomato, onion, and Enchilada sauce. Layer 2 consists of ground chicken, habanero peppers, beans, corn, cheese, and enchilada sauce. You can easily tweek this recipe to be vegetarian by removing the chicken and swapping for extra veggies, beans/lentils, or cooked quinoa. In a large skillet, sauce the peppers and onion in 1 tbsp of olive oil. In a large casserole dish, spread olive oil on the bottom and then distribute tortillas to cover the bottom of the dish. Add the sautéed peppers on top of the tortilla layer. Add the chopped tomatoes to this layer. Distribute half of the enchilada sauce evenly on this layer. Cook the ground chicken on medium-high heat in the skillet with regular mixing. Add 2 tbsp of chili powder and 1 tbsp of cumin. Add another layer of tortillas on top of the veggie layer. Add the cooked ground chicken on top of the tortillas. Add 1 chopped habanero pepper, the corn, beans, distribute the rest of the enchilada sauce, and add cheese as desired. Sprinkle 1 tbsp of chili powder and 1 tbsp cumin evenly about the top. Bake at 350F for ~20-25 minutes. Put it on broil for the last 5 minutes to brown the cheese on top. Throwback to one of my favourite recipes! Craving this right now. 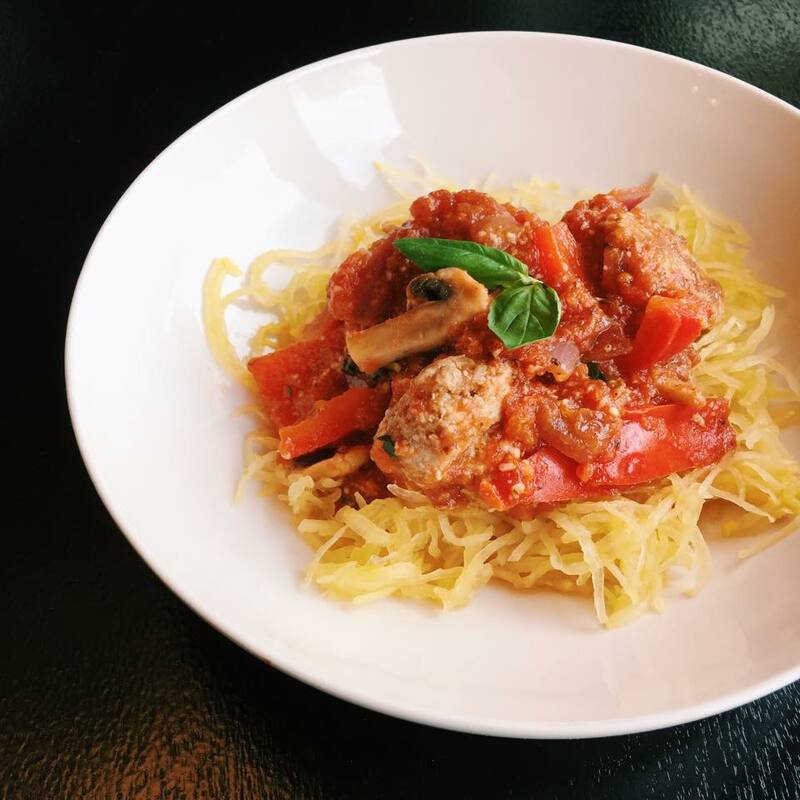 Spaghetti squash is one of favourite swaps for regular spaghetti noddles. Whooooo says spaghetti has to be unhealthy to be delicious? Spaghetti Squash is a great source of Beta Carotene which converts to Vitamin A within our body. Vitamin A maintains healthy vision and skin. Directions: Preheat oven to 425. Poke squash multiple times with a fork. Put in the microwave for 3 minutes on high. Cut in half and remove seeds (like carving a pumpkin). Place on a baking sheet and put into the oven for ~30-35minutes until soft. Allow to cool for a minute and then using a fork, scrap the squash into “noodles”.